The Preschool Director with every Healing Knots she owns! 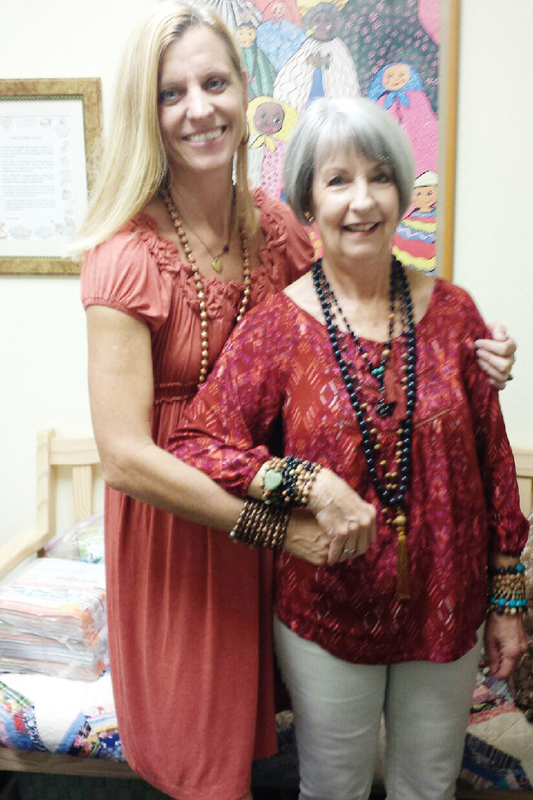 Yesterday I taught a Healing Knots class to a really special group of ladies. I was finishing a chapter with the preschool where I have been a parent since 1993 and been teaching Creative Movement for 12 years. Well, I have no idea how to thank the people in that wonderful family of preschool so I offered them a Healing Knots class to make their own “Thank You” bracelet. I also invited a few other people that have been witness to the Healing Knots story but never attended an actual class. This is a simple thing. 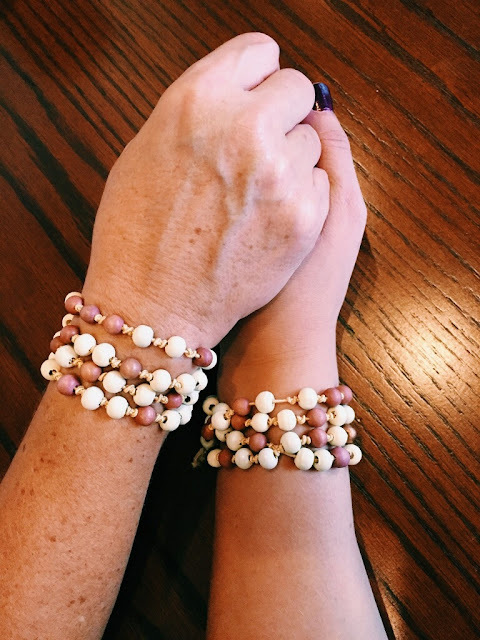 You just show up and spend about 15 minutes in the beginning tapping in to what you might be carrying in your heart, I share the story of how Healing Knots walked into my broken heart and then everyone begins to design and make their own bracelet. The bracelet that might tell the story of their heart at this moment; the bracelet that might help them take the next step to healing, love or celebration! This experience is always new. You never know what will happen and what emotional journey this will bring. Yesterday was no exception. One of the women felt her heart in such a way that her tears just fell. Beautiful tears of love for her brother that she lost a year ago. Another woman could only pick red beads. It is the only color she can see right now. She needs the courage that red brings her as she walks with her mother down a path of healing. Every person had colors, numbers, stories that were rich with life, emotion and most of all, hope. For me, it was closure to the most nurturing and healing environment I could have ever wished for my children to attend preschool. Then the gift became mine. The gift of working with children and teaching them new tricks in the gym, the whole time they were teaching me. Teaching me how to be filled with wonder, to ask questions, to share what your heart is filled with and to have fun!!! The teachers are like my sisters, mother, aunts and friends. It is a building that is filled with one BIG HUG. Well, I have a graduated from preschool and it is time to go out in the world and take that message to a new place. Luckily, I am old enough to know the truth: we are all 4 years old on the inside. No matter how fancy the office or how serious your “to do“ list is, we are just simple people that need to be loved. I thank the children that reminded me to just love and the teachers that taught me patience, understanding and acceptance. Be kind. Tell the truth. Everyone is your friend. Work hard and most of all don’t forget to play!! !